Termites are the single greatest economic pest in the United States. They cause billions of dollars in damage each year to homes and buildings. If they go unnoticed and untreated a termite infestation will completely destroy wood structures. Our goal is to provide accurate, factual termite information. We also have termite pictures available in another section. Termites have existed for over 55 million years and are extremely good at what they do. A great deal of their success can be attributed to their cooperative “hive” behavior. They are social insects. Their individual members each performs a specific job that benefits the colony as a whole. Because of this division of labor, the colony of individuals functions as a single entity. 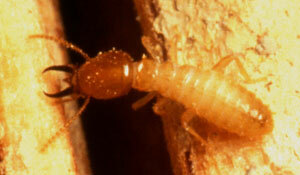 A termite colony can eat up to 15 pounds of wood in a single week! When you think about how many 2X4’s that might be, you will realize why they can quickly weaken a house or wall with wood supports. Wood, however, is not their only food. 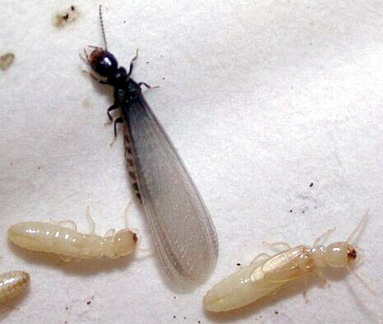 Some termites eat dirt, plants, and other things with cellulose, but they can also eat plastic, PVC tubing, fabric, and drywall when they get into a house. Termites can live for more than a year, but the termite queen can live for 10 years or more. She is constantly laying eggs, and this could as many as 2,000 per day as she gets older. In addition, there could easily be more than one queen laying eggs in the same colony. The most destructive termites in the United States are the subterranean termites. These termites are most heavily concentrated in the Southeastern parts, but they also exist in every other state – except Alaska. Annually, they can cause about $2 billion in destruction of homes, which is more than that caused by fires and windstorms combined. 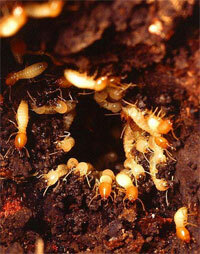 Other termites are of the drywood, the damp wood, or the mound building variety. The damp wood termites and the dry wood termites also cause a lot of damage to buildings in the United States. The other variety, mound building, does not exist here. Flying termites are visible when groups of them are leaving the original colony to start new ones. This would consist of a king and a queen and other swarming termites that go with them. This can occur in the summer and fall months – depending on what kind of termite they are. A termite swarm means that they are starting a nest somewhere nearby. This may be in your home or in one that is close by. They could also be starting a colony in a nearby tree. Even worse is that it could be a termite swarm leaving an existing colony – already in your house. When you see swarming termites, it would be to your advantage to call a termite pest control service quickly before the termite damage becomes extensive. 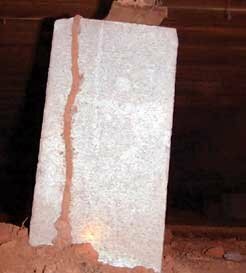 Termites bore through wood lengthwise and it is quite possible that there will be little or no evidence for a long time. During that time, however, they can greatly weaken or even destroy structures. 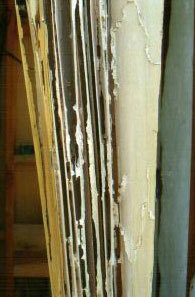 Different kinds of treatment are needed for the different varieties of termites. This makes it important to call a termite and pest control agency and get a termite inspection. They will be glad to work with you and work to exterminate termites that may be in your home, as well as to make sure that the structural damage is repaired and the termites are removed.